The Riverclack sheet installation on the roof of the Terminal Building. SIMPSON BAY, St. Maarten (Tuesday, December 4, 2018) - The Princess Juliana International Airport (SXM) officially turned 75 on December 3, 2018 and the Managing Board is making sure that not only will her beauty be restored with the ongoing Terminal Building reconstruction project, which is part of the Package One - Temporary Operations, but that operations will be transferred temporarily into the Terminal Building in time for the high tourist season. It will be recalled that the airport facilities sustained severe damages at the hands of hurricanes Irma and Maria in September 2017. 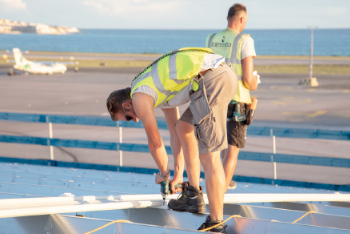 Commercial operations were restored on October 10, 2017, a little over a month after the storms forced the closure of the airport facilities which were immediately taken over by the Dutch, French and US military authorities. Project Manager, Rob Noorman has confirmed that the migration project for the Arrival and Departure operations should commence next week. The Project Management team is currently getting ready for the dismantling of the pavilions which will be done by the Event Star company. Today, a major part of the ground floor of the Terminal Building is beginning to take shape with a temporary layout as part of Package 1 - Temporary Operations. The temporary airline counters are being erected in the check-in area and the inbound/outbound baggage conveyor belts have already been tested and are in good working condition. Also noticeable are the F&B and retail concession areas that will be ready for handing over to the concessionaires in the next couple of weeks. Returning concessions like Subway, AMA, Dutch Delight, Domino’s Pizza, Market by Villa, Taloula’s Flights, Relay, ESCA, Shipwreck Shop, Gouda Liquor Store, Le Bistro by Bacchus, Princess Promenade, Aunt Clara’s, Johney Burger and KAFFE will be available to the travelers and partially to the public. The Package 1 - Temporary Operations of the reconstruction project also includes the immigration and emigration booths, offices, the reinstatement of the existing air-conditioning and sprinkler systems, the installation of the fire alarm and public-address systems, CCTV surveillance and security equipment, as well as IT systems and seating. On November 30th, members of the Project Management team gave a tour of the Terminal Building to the airlines and handlers. This was also done during the setting up of the temporary Departure and Arrival pavilions, allowing the airline professionals to provide their input on the proposed operations. They were also briefed on Phase 2 of the ongoing roof works at the Terminal Building which are being executed by Ballast Nedam. At present, all the profiles for receiving the roof sheets have been fixed onto the roof deck, in total approximately 16 kilometers! In front of the Terminal Building a very visible large container tower was erected recently. On top of it is the Riverclack container with the forming machine which extrude the roof sheets in one piece over the full width of the roof, whereby its longest length will be 75m. Phase 2 of the roof works is slated to be completed between the end of the year and January 2019. As the start of the high traffic season looms near, the airport community is busy with preparations for the increasing traffic.